Pizza and Other Stinky Poems illustrated by Amanda Haley is reading level four (grades 3+; ages 8+), but when read together can be a fun book for kids and adults of all ages. My daughter and I read this during Readathon, and she laughed at the words and the pictures created by Haley. There’s even an old favorite in here that I remember from my own childhood, “Meatball,” and one we still use today “Ice Cream” (“I Scream, You Scream, We All Scream for Ice Cream”). It’s been wonderful to see my daughter pick up books and want to read together, and it is even better when she reads to me. It amazes me how much she has learned in just half a year of Kindergarten. She has books now that she can read on her own, and I know that this poetry book will be a permanent part of her collection. 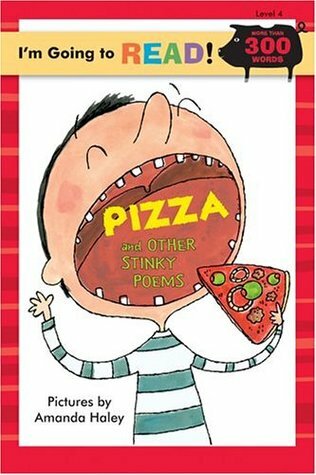 Pizza and Other Stinky Poems illustrated by Amanda Haley is delightful and plays to children’s interests in food, smells, and silliness. Paw Patrol: King for a Day!